IWroteThis.co.uk Live: Why do I get up in the morning? ​Why am I here? Do I enjoy my job? Am I happy? Where do I go next? Unless you are very lucky indeed, your current job is probably not where you feel at your happiest. You may strive for promotion, or for a similar role for more pay. You may feel that you are struggling - or that you are bored, or that you lack direction or meaning. This year's favourite lifestyle concept, hot on the heels of last year's hygge, appears to be in a position to help us answer some of these questions. Perhaps more importantly, it can provide a useful perspective to those of us for whom career conversations do not come as naturally, and who need a starting point to explore our aspirations. There are competing pressures between the things that we want to do, the things we are good at doing, and the things that need to be done. The sweet spot is in the middle - we like it, we're good at it, and it's needed. There are always ways of moving our work towards the middle segment. Some of these actions are personal (identifying your training needs, say, or your own values and aspirations). Some are external (supporting functions, provision of training and mentoring, help in balancing your workload). For activities that we don't want to be doing, we can try to move tasks out of our remit altogether - perhaps by training other people, or engaging with other functions or support staff. But as it turns out, I didn't invent this at all. 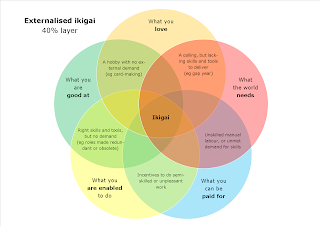 Search for ikigai and a diagram remarkably like this one turns up regularly. 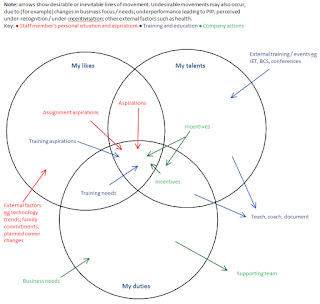 All that's different is that it adds a fourth circle for remuneration. 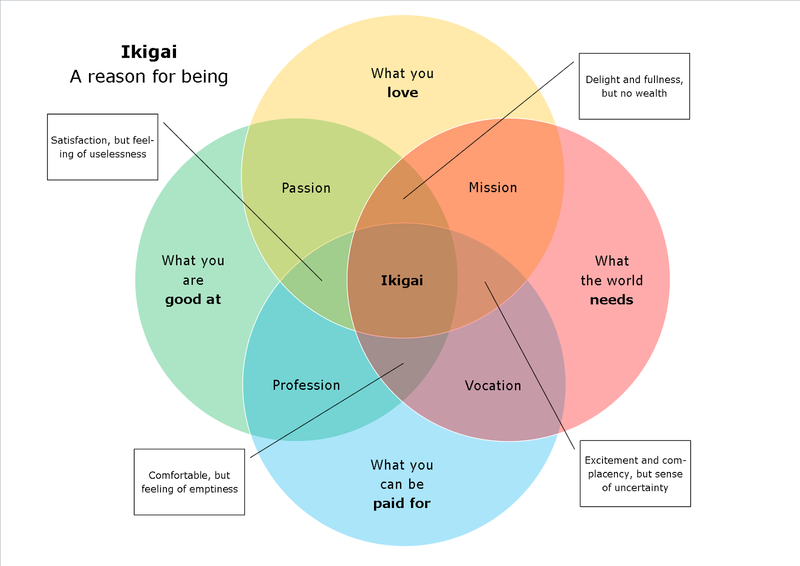 Ikigai is the Japanese concept of "reason for being", or "life purpose". And it's all the rage in the West right now - in just the past couple of weeks there have been in-depth articles in The Telegraph and BBC Capital. Each offers a totally different perspective and both are well worth reading. Now, we can probably critique this model. (And not just, as the BBC article states, because it's a distortion of the original Japanese meaning of ikigai.) But it probably broadly holds for many jobs and for many of us. Replace the "paid for" circle with something a bit more generic - because it's technically possible not to be paid for some jobs, but to be supported in other ways instead - and we're nearly there. In my workplace, though, people are in a secure job, are well-paid, and do interesting work - yet they still, too-often, express discontent. Or, to put it another way, despite the obvious perks of work here, people still feel undervalued and leave the company. So let me propose a fifth circle. We can call this enablement, in the sense of provision of the tools, authority and support to allow us to get on with our jobs. It might also encompass intangible support, such as praise and recognition for a job well done. 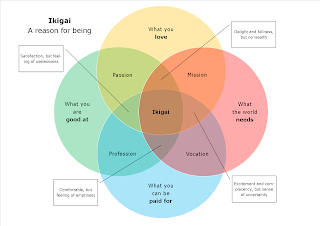 Now we can see clearly that our ikigai is dependent both on ourselves - what we like, what we want to be doing - and on our employer. We have externalised some of the reasons why we might be satisfied or dissatisfied at work. Anybody who's done a mentoring training course will know that externalisation is generally a bad thing. It often correlates to low engagement ("I can't change the current system") and assigning blame ("I didn't get a promotion because the system is broken"). in some cases, referring the individual to counselling through our Employee Assistance Programme (to help understand external factors over which the company has no control, such as relationship problems or money worries). In fact, all you actually have to do is work out which segment you are currently in. 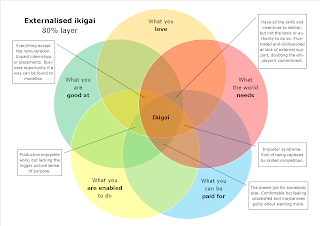 From there, it should be reasonably straightforward to identify the relevant changes needed to get you on your journey to ikigai and the support that you will need to achieve this. The following diagrams show some of the characteristics that might be expected of a role in each segment. Each subsequent diagram moves closer to the goal at the centre. 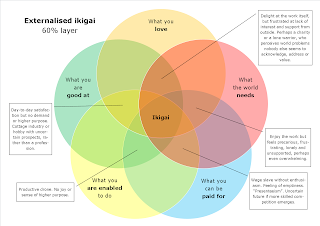 Note that these are entirely my own views, not part of the conventional understanding of ikigai - I would welcome your feedback. I think this correlates well with the results of internal "pulse" surveys. We are proud to work for our company because we make a difference ("what the world needs"), and we enjoy working with passionate people ("what you love") who are very often experts in their field ("what you are good at"). But sometimes the processes aren't as good as they should be, and even with good remuneration, that can lead to frustration. You might well dismiss this whole model is being irrelevant. 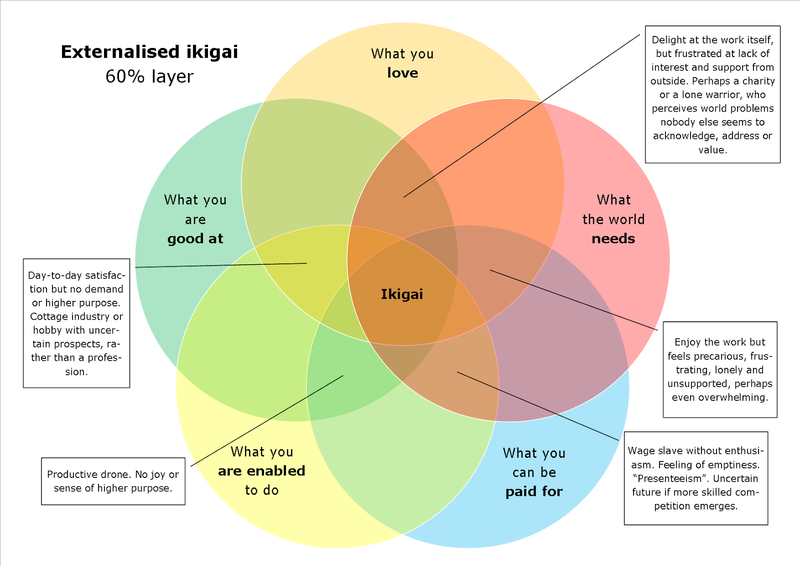 Perhaps your personal ikigai is your family, or a hobby, or a charity that you are proud to support. That's understandable. 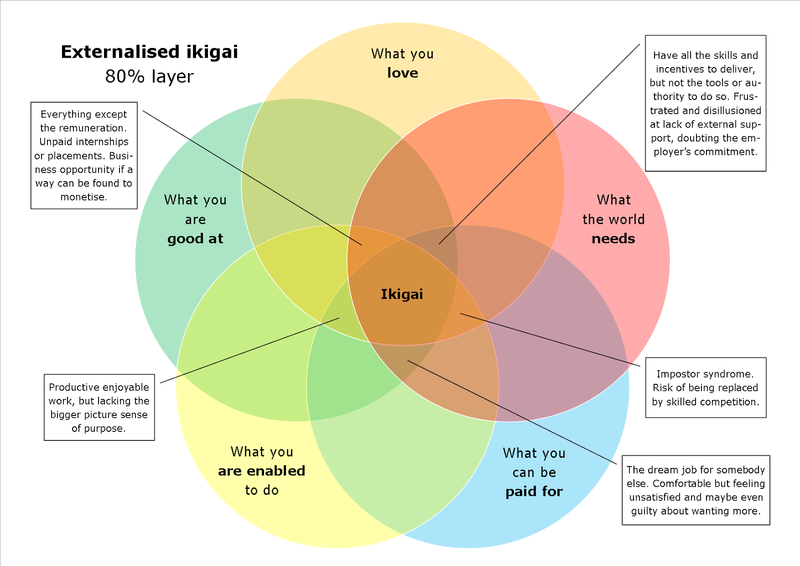 In which case, you probably recognise your work as a necessary enabler of your true ikigai. And, if so, this model can still help you to make the most of your working life, and help you to answer the question - why do I get up in the morning? What do you think? 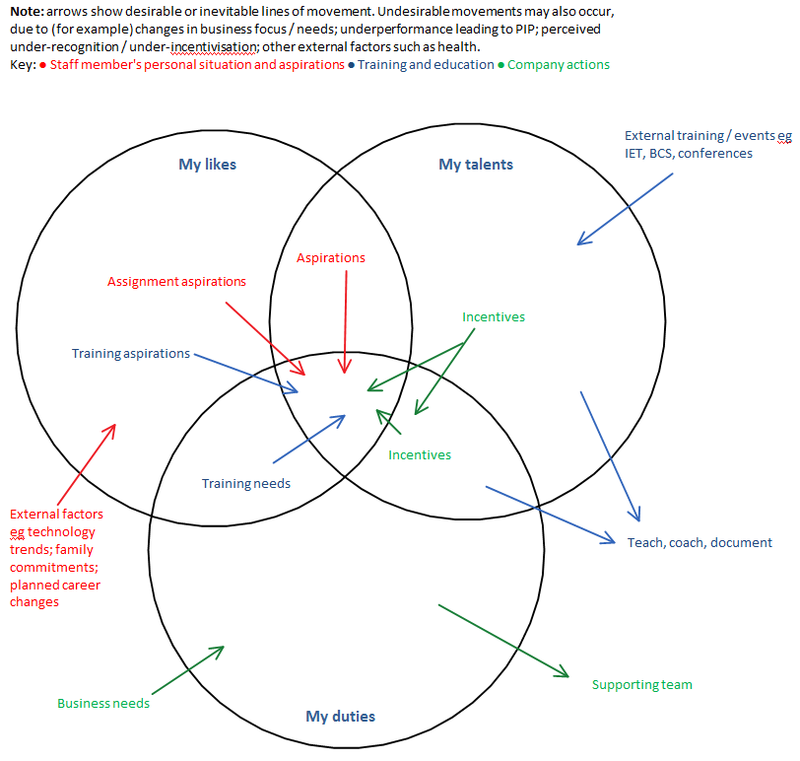 Is this a useful perspective for starting a career conversation? And have you come across a model that does it better? Credit: The wording in the conventional ikigai diagram is taken from a graphic by the Toronto Star, which appears to be the most widely-shared version of the ikigai-as-workplace-happiness model. ​A version of this article was originally published on my company internal blog.